I haven’t been this excited about an exercise iPhone app for a LONG time. 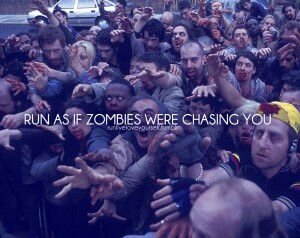 It’s called ZOMBIES, RUN!. While you are running, whether it’s outside or even on a treadmill, it feeds you audio cues telling you when you need to run away from the zombies. The better you perform, the more supplies your base will get and the more likely your crew will survive. It works with your music playlist, so the audio cues will cut into your very own workout mix. I wish I could download it RIGHT NOW for today’s workout, but I’ll have to wait until the end of the month when it will be released for the iPhone. If you are an Android user, you’ll have to wait a little longer. It is available for preorder and I’ve paid my amount so I can start training for the zombie apocalypse now. Update 02-25-12: The Zombies, Run! game went live for people who pre-ordered yesterday, but it was too late for me to take on my run, so I ran with it this morning. I haven’t gone running outside in the cold for MONTHS, so I was worried that this workout would be too intense for me. Fortunately, this app works with every fitness level. If you can barely walk, all you have to do is walk a little faster when the zombies are coming for you. Believe me, the story is captivating enough to make you WANT to walk a little faster. My usual walks have been at about 3mph, but after I finished my workout today, I walked/ran an average of 4mph. Sure, it was hard, but it felt good to get away from the zombies, especially the previous Runner 5. While this app works on the treadmill, you cannot enable Zombie Chase Mode unless you’re running with GPS. I ran outside in the cold wind today, but the unpleasant weather was hardly noticeable. I was planning on just doing a treadmill workout, but I really wanted to experience the zombie chases, so I dug into my workout drawer and found the winter sweatshirt and ear warmers to brave the chill. I planned on doing a 20 minute walk, but when the game told me to make a detour to the hospital to pick up some first aid kits, I LITERALLY extended my planned workout and walked to the nearest InstaCare. I don’t believe the game could see that I was close to the local hospital, but it was an added bit of realism that extended my workout to 33 minutes without feeling like drudgery. In fact, I felt proud that I was able to pick up all those bandages and first aid kits on the way. There is a robotic voice that breaks in during my music that tells me when I’ve picked up supplies. Most of the time, I can’t understand what it said, but I can see my complete inventory when I get back from my run. I guess just knowing that I picked up SOMETHING is enough for me. Instead of a pack of rabid dogs, this time, I’m running away from the zombie apocalypse. This app is EXACTLY what I wanted from a primal workout. Strangely, I can’t wait to go running again tomorrow.